Frances McColl Stewart lives in Courtland, VA with family. Semi-retired life (does a freelance writer ever truly retire?) remains full and varied with embroidery, family happenings, Bible study, and a new interest in archeology. A member of Mensa’s Webheads, her personal websites have garnered much recognition in different fields: N-ettiquette.com is a primer on Internet Etiquette and McColl-Name.com is a genealogy site. 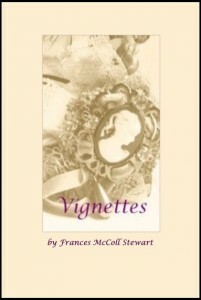 Frances’ books: Neé McColl, Mac and the Princess, and Search Engines, The Right Way (co-authored with Tiffany Kay Edmonds), are available on amazon.com and barnesandnoble.com. I miss the days of thrumming sound felt from heart to feet. At times I can convince myself I miss the red, the heat. Mirage-like ripples travel up, obscuring flat terrain. Then blessed reward – Daytona, that wet-sand hard-packed track. Hot, of course, but ocean breezes stroke and cool a back. And time there is for one good race before the day is done. Directed straight ahead, are used to clear their course. Anything can happen before that flag comes down – don’t blink. You know who wins until they do. Fireball’s up in flames again. And Petty hit a gull. Elliot’s run out of gas. Dear Lord, it’s pouring rain. Hunter’s got a flat and not heading toward the pit. Harley’s coming round the turn — Please God, don’t let him hit. Labonte’s car has thrown a rod, he’ll be out a while. Nerve and joy and honor — Inimitable style!